No matter how hard President George W. Bush and his senior aides try, they won’t be able to restore the last bit of the fig leaf with which they had been covering their illegal invasion and occupation of Iraq. Having earlier lost most of the fig leaf – Iraq’s alleged possession of weapons of mass destruction and its links with Al Qaida -- they now stand stark naked before the world audience, a reversal of the physical role their vicious prison guards had hitherto imposed on the hapless Iraqi detainees in the privacy of their jails. The Iraqi prisoner scandal is the tipping point where the self-proclaimed foreign liberators of Iraqis find themselves transformed into oppressors by those whom they claim to have freed. The USA Today/ CNN poll in April showed that 57 per cent of the Iraqis wanted the occupation forces to leave immediately whereas 36 per cent wanted them to stay longer. Part of this survey was conducted before the scandal of the Iraqi detainees’ torture and the preceding Shia uprisings. The center of the latest scam is the Abu Ghraib prison -- the very place where Saddam Hussein’s torturers deployed their heinous techniques – a coincidence which Hojatalislam Muqtada al Sadr, the radical Shia cleric, was quick to exploit. “America is doing the same acts as done by the small devil Saddam and in the same place where Iraqis were oppressed [before],” he said in a Friday prayer sermon. On top of that, the American forces damaged the golden dome of the Imam Ali shrine on 14 May in their pursuit of the militia of al Sadr’s Mahdi Army, thus following once more into the footsteps of Saddam Hussein whose troops damaged the holy shrine while quashing the Shia uprisings in the aftermath of the 1991 Gulf War. The dramatic collapse of the Bush Administration’s moral authority, as illustrated by the hideous treatment of the Iraqi detainees, coincided with the failure of its military machine to impose its will on the Sunni city of Falluja, or to capture or kill al Sadr. Having failed to expel the Mahdi Army militia from Karbala, the American forces withdrew from the city on 20 May, unable to cope with the barrage of mortar fire on their position at the Mukhaiyam Mosque and the unending sniper fire on the troops patrolling the surrounding streets. This underscored the limitation of the Pentagon’s doctrine of ‘overwhelming force’, a strategy effective only in fighting a conventional army. However, the invasion was part of a highly ambitious project to refashion the post-Saddam Iraq into a client state of Washington. Its contours were visible in the scenario that Rumsfled sketched during the US National Security Council (NSC) meeting on 1 February 2001 when he waxed eloquent about a democratic Iraq, the Kurds in the north, the oilfields and the reconstruction of Iraq’s economy. The last objective was to be achieved by a wholesale privatization of the industries in an Iraq where the public sector was dominant. By the end of 2001, the Bush team had finalized its plan for transforming the Iraqi economy. This revelation was made by Gen. Jay Garner, the first U.S. pro-consul in Iraq, in his interview with the BBC in March. He disclosed that he was dismissed unceremoniously from his job in May 2003 partly because he wanted to hold elections quickly, which clashed with the priorities of Bush’s senior aides, who wanted to privatize Iraqi industries first -- a step Garner’s successor, Paul Bremer, would take in early September. Transforming the Iraqi economy of the ruling Arab Baath Socialist Party -- with a strong public sector, resting on the solid foundation that oil and gas resources belong to the state -- into a free-for-all capitalism was a high priority aim of the Bush White House’s project in Iraq. Next in importance was its strategy to use a pliant Iraq to weaken the Organization of Petroleum Exporting Countries (OPEC) by consistently exceeding its OPEC quota, thanks to its oil industry to be brought into thrall of the American (and British) petroleum corporations. These features of post-Saddam Iraq were to be secured by establishing U.S. military bases in a country that borders six states – all but two, Kuwait and Jordan, being important -- thus furnishing Washington, at the very least, with an effective leverage to pressure the regimes in Iran and Syria. All of this was to be rooted into a New Iraq, armed with a secular, democratic constitution, to be drafted by Iraqi ‘experts’ guided by the Americans and endorsed in a referendum, producing an elected government suitably pliant to the wishes of Washington – the whole process taking up to three years. Above and beyond that was the overarching ambition of Bush to get re-elected in November 2004. Indeed, overthrowing Saddam Hussein under the guise of waging an ongoing “war on terror” was part of Bush’s strategy to win a second term. So, once the developments in Iraq began deviating from the rosy scenario the Bush team had concocted before the invasion, Bush began temporizing. Following the downing of three helicopters by the Iraqi insurgents in late October-early November, he scuttled the idea of a slow, but assured, march towards a New Iraq created in the image of the US, and opted for the transfer of sovereignty to Iraqis by end-June 2004. This was a mere trimming of sails, however, with the overall objective of taking the vessel to the pre-determined port unchanged. So, the public admission of Marc Grossman, the US state department’s under-secretary for Political Affairs, that what the U.S.-led Coalition Provisional Authority (CPA) would transfer to the Iraqi entity on 30 June would be ‘limited sovereignty’ came as no surprise. In other words, the neoconservative architects of post-Saddam Iraq as a client state of Washington have not abandoned their plans yet. The only eventuality that can compel them to do so is the rising tide of popular disapproval of continued US occupation of Iraq at home, a process which derives its strength from a growing realization that the escalating cost in American blood and money exceeds any benefit that may derive from a stable, democratic Iraq, an objective that seems increasingly unachievable. That is beginning to happen. A CNN/USA Today poll, published on 11 May, showed that by 4:3 Americans said that war on Iraq was not worth it, a reversal from the figures published in late March. It was the first time in the long-running Iraq saga that a majority of the respondents had come out against the war on Iraq. On the prisoner abuse by the US military, four out of five Americans felt bothered, with two-thirds of them ‘great deal’ and the rest “fair amount.” And three out of four respondents said that such behavior could not be justified under any circumstances. Evidently, this marked the tipping point in the public opinion in the US on both the invasion and occupation of Iraq. The reverberations are being felt in Washington where Bush made a rare appearance on Capitol Hill to calm the jangled nerves of Republican lawmakers, worried about blood on the Iraqi battlefield and confusion in the upper echelons of political power at home. Such turning points have occurred in the history of imperial Europe. In Britain, popular support for the imperialist war in Kenya in the late 1950s to crush the Mau Mau nationalist guerrilla struggle fell after the exposure of a fatal beating at the Hola detention camp. Around the same time it was the leaked International Committee for Red Cross report into torture in Algiers that proved, in retrospect, to be tipping point in the French support for the war of occupation in Algeria. With the instant, worldwide transmission of images, described by Rumsfeld as “blatantly sadistic, cruel and inhumane,” in our Internet era, the voters at home in the neo-imperialist countries like America are exposed directly to the dark side of the armed occupation of a nation that is racially, culturally and historically different from them. These are the stark facts that Bush and his British cohort Prime Minister Tony Blair must face. They must register too the findings of the USA Today/ CNN poll of Iraqis in April. It showed that only 23% had a favorable view of America and that the percentage for Britain was 19. There was no ethnic or sectarian breakdown of these statistics. But it is safe to assume that almost all Kurds, forming 15-18% of the population, who enjoyed autonomy under the Anglo-American air umbrella during 1991-2003, had a positive view of their protectors. Among Iraqi Arabs, therefore, those who had a favorable view of the America and Britain amounted respectively to 8% and 4%. In short, the façade of liberating Iraqis as an altruistic enterprise that Bush and Blair have been peddling to an increasingly skeptical world community has finally cracked. Dilip Hiro is the author of Iraq: In the Eye of the Storm. 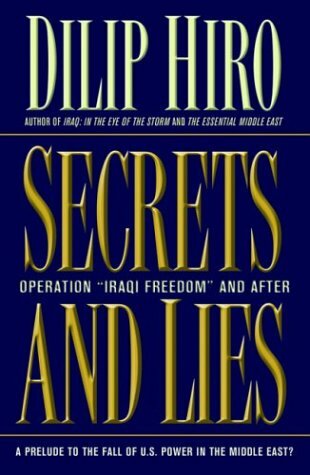 His latest book is Secrets and Lies: Operation “Iraqi Freedom” and After (Nation Books). His articles on the Middle East, Islamic affairs, and South and Central Asia have appeared in such European and North American publications as the Observer, Guardian, Sunday Times, The Times, Independent on Sunday, International Herald Tribune, New Statesman, Washington Post, Wall Street Journal, Los Angeles Times, The Nation, Boston Globe, and Toronto Star. Thanks to Ina Howard at Nation Books.